Shoppers queue for free food on the opening day of Jack’s. Pic © Jake O’Neill JMU Journalism. 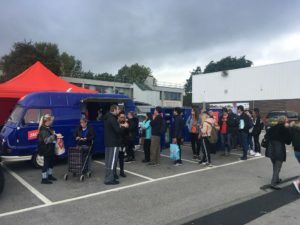 The Tesco-owned branch has also set up a store in Four Acres, St. Helens, as Jack’s aims to rival the likes of budget supermarkets Aldi and Lidl. In recent years, budget supermarkets have risen to the top, challenging retailers such as Asda and Morisons. Located opposite a large student accommodation block, Jack’s in Overton Street, Edge Hill, has replaced the Tesco that had closed down just months before due to profit loss. The opening on Thursday proved successful for the new branch, who were providing ice cream, chicken tikka and prosecco on arrival. Assistant store manager, Tom Evason told JMU Journalism: “The opening day has been brilliant. We’ve been open since 8am and its been busy ever since. We’re well over our projected sales. We’ve sold a lot, especially to students in the local area. However, not everyone is convinced about the opening of a new budget supermarket locally. The stores, which are named after Tesco’s founder, Jack Cohen, didn’t have Lotty Erns convinced either. Tesco launched its Jack’s stores as part of its centenary and celebration of ‘100 years of great value’.